When a brightness up or down hotkey is pressed, the screen shows a OSD and panel brightness is changed accordingly. A simple action results a simple output, but what happens underneath is a lot of magic. Figure 1 shows a overview from software perspectives. When a hotkey is pressed, ACPI events are generates that triggers a series of actions specific to OS which eventually changes panel brightness. 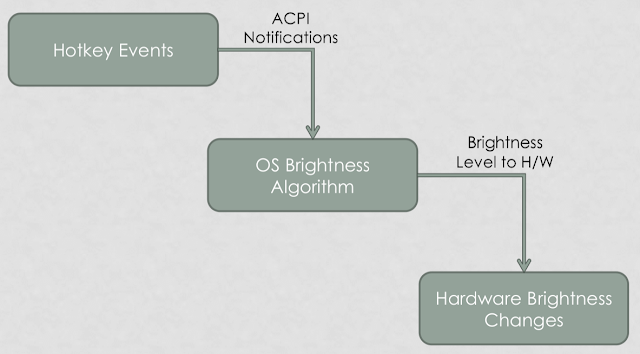 More information can be found in "ACPI Brightness Control (1) - Control Methods". As Windows 8 no longer uses, many BIOS engineers never check whether _BCM works (please remember ACPI requires _BCM to present in order to support brightness controls). In Linux, you can and write to /sys/class/backlight/acpi_video0/brightness to verify whether _BCM works.